What are the main factors in ball flight curvature and distance? Ball curvature and distance control are key to any great iron shots as we all know, but let’s truly understand how the club is influencing the golf ball. This article will help simply the curvature of the golf ball in flight and understand distance control. This should help my students understand what we are working on certain areas of their full swings to maximize accuracy and distance. Ball curvature is more of a science now than ever with the invention of products like FlightScope over the past 10 years. These companies were born out of military ballistic tracking radars for missiles in flight. Amazing we are now tracking golf ball and the clubhead of the golf club with the same technology. More importantly understanding the dynamics at impact and the effects on ball flight are progressing at a rapid rate and new data is surfacing about the effects the club has one the ball. The practical uses for this technology is to measure trends and compare over time to see if players are trending in the correct direction with some of the numbers, not to analysis every single shot. I tell players all the time that this machine is to help you “feel” a different swing and know when you have exaggerated the positions of your swing enough to create a different ball flight. 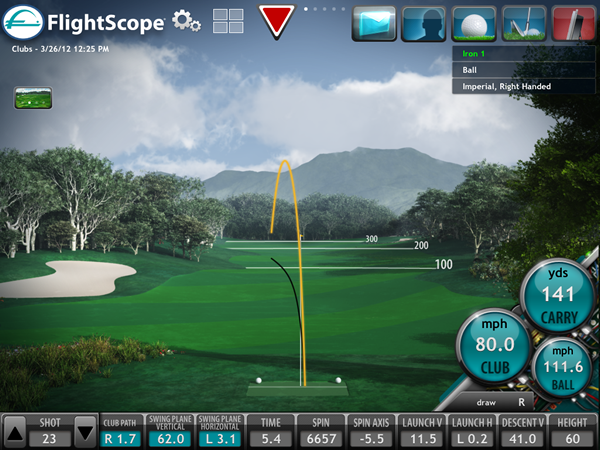 If you would like to know more about the product go to www.flightscope.com and setup time with me to take a look at your clubhead numbers and ball flights. There are five main reasons why a ball does what it does while in the air from a ball flight curvature and distance point of view. These are the main ball flight factors and what control where the ball starts, turns, rises, carries, and the angle it lands. Because of the complexity of impact, I am going to attempt to make this as clear as possible and as simple as possible, but understanding the “nuts and bolts” should motivate you to work on the “how” we discuss in your lessons. Club face to path ratio is quite simple, if you do not add or subtract in angle of attack of the golf club, so for this discussion on curvature we will assume angle of attack is at 0 degrees (this means the club is traveling perfectly parallel to the ground at impact). We will also be assuming we are swinging on a 45 degree vertical swing plane to make the math work easier to understand, even though that is more of a driver vertical swing plane. I want the curvature of the ball flight to be understood without those factors skewing the numbers. Club path in this case is now just the swing direction and if you were looking from above the ball it would be the club head swinging left or right of the intended target line during impact. The difference between where the face is pointing at impact and now the path/swing direction is the first major factor of ball flight. The face of the club will influence the initial flight of the ball, but the ball will always turn towards where the club path is swinging during impact. When the path and the clubface are moving and pointed in different directions that is when the ball curves. Notice the image below, the path is 7.6 left and the clubface is pointing 8.2 right compared to where the path of the clubhead is swinging. This would make the clubface .6 open to the target line, if this shot was hit in the center of the clubface with good clubhead speed this would be a considerable slice. Even though this clubface is open compared to the target line, it is possible to hit a slice with a closed clubface compared to the target line as long as it is more open than the path. Just for information reasons for those of you who are wondering why the Path and H-Plane (Horizontal Plane or swing direction) is 2.7 different it is due to the angle of attack factor and even though the club is swinging left 10.3 left the angle of attack was 2.7 down which creates a 7.6 left path which is about 30 percent of what the ball listens to when creating curvature, 70 percent to the clubface. The more the loft the less the ball listens to the face and the lower the loft the more the face of the club will play a part, that’s one reason the driver the slightly more difficult. If you could draw a line along the path and the face is pointed to the right of that plus the loft of the club it would be pointing at the angle of the loft of the club and the face angle at impact. The image below is actually a pretty close depiction of what the curvature of this ball flight would look like. Notice the plane created between the path and the face/loft and that is what the ball travels on and if this plane is tilted, the ball will have a tilted flight just like an air plane taking a right turn just after takeoff, this is called the spin axis of the ball and is a product of the clubface, path, and dynamic loft (loft at impact). This would not be the desired ball flight for most shots, but understanding what controls the curvature can give you an advantage and allow you to hit certain shots that you typically cannot achieve. There is no definition of a perfect swing and even though a zero path and zero face angle would produce a straight shot this is not the most repeatable pattern for most players. Most right handed players would benefit from a path that is between 1 and 3 degrees to the right of the target line and a clubface between 0 and 2 degrees right of the target line, assuming center contact. This pattern would produce a higher draw shot pattern. There are some players that can and do play outside of this range that are very successful, but we are talking about the average player trying to take their game to the next level. It is very cliché to talk about hitting the ball in the center of the clubface, but if you understand the science behind it and the effects on the flight of the ball you will be more motivation to work on it. We can work on improving path and face angles to get them to match the desired ball flight, but if we miss out of hitting the center of the face we would still not have the desired ball flight. Now, my opinion is that typically working on an improved path will help us hit the center of the club face more often, but that is not always the case with all players. There is an effect on the ball when it is hit from the heel and the toe that can significantly affect the flight of the ball, it creates something called “gear effect”. When the ball makes contact with the toe of the club face draw bias spin is imparted to the ball and vice versa on the heel there is fade spin bias placed on the ball. So, even if we have 0 Path and 0 Face angle, which theoretically would be a straight golf shot, if the ball is struck with the heel or toe the ball will draw or fade. There is no substitution for centerness of contact. Contacting towards the heel and toe the size of a golf ball dimple from the center of the face affects the spin axis (the angle the ball is spinning on during flight, think of an airplane tilted left and right) 2 degrees. This is not a large noticeable effect on the ball and might only be 2 to 4 yards of curve with an iron, but we are talking about the off centered hits that are 3 to 4 dimples away from the center, then we are talking about 8 to 16 yards of curve. 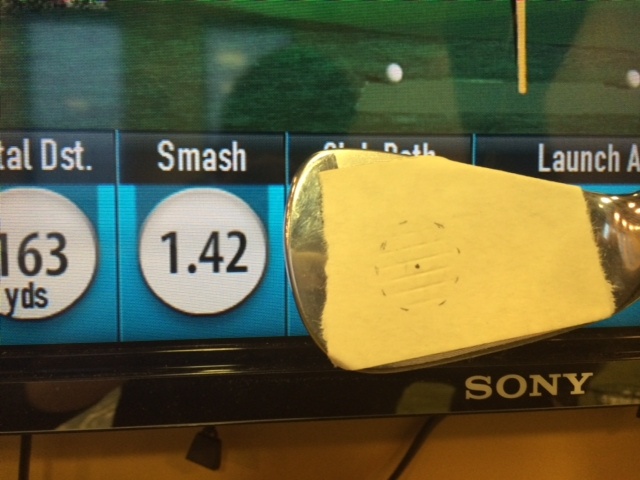 People can get thrown off by Smash factor (Ball speed divided by clubhead speed), but it is not a good indicator for centerness of contact due to dynamic loft can create a inflated smash factor when the club is delofted at impact, see the image below the dynamic loft for this 7 iron was 19 degrees. The 1.42 would be a very high smash factor and some might think this shot was hit in the center of the face, but clearly you can see this is on the toe. This is an obvious place to start for distance. There is one exception, not hit the center of the club face. For every mile per hour of clubhead speed, with an iron, players tend to pick up 1 to 3 yards depending on the other factors discussed earlier and the loft of the club. Ensuring that the path of the club is on the correct plane in the downswing is one of the fastest ways to make sure you are maximizing your current ability and fitness level. For a right handed player when the club swings on a path to the right during impact the swing plane is typically flatter and from a deeper hand position in the backswing. This allows you to use your lower body into impact in a rotational position as well as the upper body. The opposite is true when a right handed player swings the path of the club to the left, the club is typically on a steeper plane on the downswing and when that happens there way typically club head throwaway (the clubhead is release too early on the downswing and causes a loss of stored power) with the players hands and upper body. So, a simple way to ensure you are maximizing your current physical ability level is to ensure your path and swing plane numbers are correct. The conversation earlier was a great interlude into this distance factor. This was one of the curvature factors, but the curvature of the ball can also affect the distance and the ball speed due to the lack of compression. When trying to create distance I like to see minimal horizontal friction and this is minimized by creating the correct path and face angle that doesn’t create excess club face swinging across the ball during impact. This will be different for every player and a 0 path is not needed to create great golf shots, in fact very few play from a 0 path on purpose. Horizontal friction is caused when the club path and the face angle at impact do not match, it is good to have some draw bias for players that are looking to maximize their distance so there is some horizontal friction that is helpful, but even too much draw horizontal friction can cause a loss of distance. The larger the differential between the two (face and path), the more the club face is creating more tilt in the spin axis, more hook or slice and less playable distance. Playable distance is very important to understand and with your clubhead speed the ball, to land the ball on the green with the correct spin and decent angle, there has to be minimal horizontal friction. Spin loft might be a new term for some of you, but it is the difference between the loft of the club at impact (dynamic loft) and the angle the club attacks the ball. If we discuss a 7 iron (loft 34 degrees) and the dynamic loft (loft at impact) at 27 to 30 degrees and the angle of attack at 2 to 4 and we are assuming that the face and path are in a playable range, this would be a good average to obtain for most players. Higher handicappers typically get in trouble when they are delivering the club into impact with too much dynamic loft (sometimes players are adding more loft than the club has because the club is leaning away from the target) and the ball launches too high and spins too much for that specific club to maximize the distance with the 7 iron. Lower handicappers tend to deloft the club into impact and the ball carry a good distance, but will come into the hole too flat, with not enough spin to hold the green. This is why spin loft is so important to each player looking to maximize, not only the distance in their iron play, but to find their Playable distance. Each players clubhead speed will create a certain distance and then from a playability stand point we need to create the correct spin loft throughout your irons. I know for some of you this might be a little overwhelming and some of your already understand this information. I hope this was a clear explanation about how we can control the curvature of the ball and create the correct distance for each of your iron shots. Contact me if you are interesting in checking out your numbers and maximizing your iron play.